Five Fridays, fifteen wide releases, a slew of limited engagements, and the activation of Wednesdays for additional real estate: it must be August. We’ve got sharks, Pooh, canines galore (in multiple forms), and Muppets gone bad to sprinkle a little fun, terror, and plenty of popcorn-throwing eye-rolls into your summer’s swan song before another school year begins. Which to choose from now that MoviePass is no longer running at full speed to catch them all? No other month is as crucial to marketing reach that cuts through the noise than this one and yet no other month is hampered by a dearth of creativity either (except maybe January). But while big budget character sheets will assault you everywhere you turn in the lobby, a few should stop you from running with eyes closed to your seat. Audiences know what they want to see during the summer and will go regardless of advertising. It’s therefore the perfect moment for the independents to sway them back for something different too. 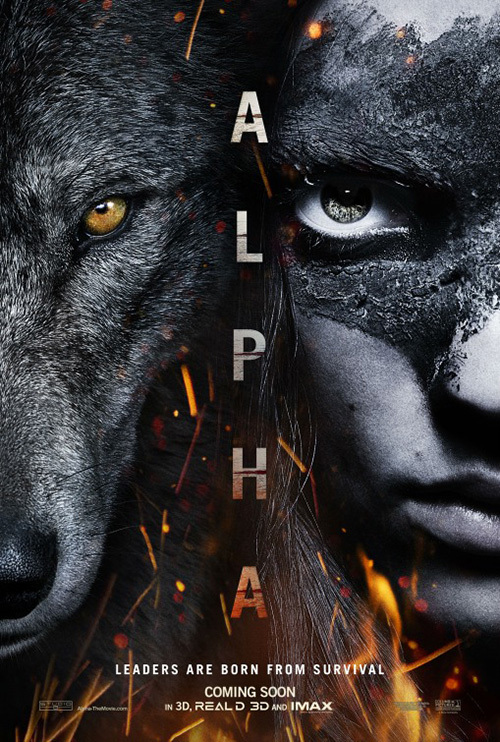 I laugh now whenever the latest trailer for Alpha (August 17) starts playing with its inspirational soundtrack and optimistic voiceover about “man’s best friend.” I laugh because it wasn’t too long ago when I sat in that same theater and watched a very different tease depicting a boy left stranded in the wild who must tame a wolf to prove his might as a warrior. 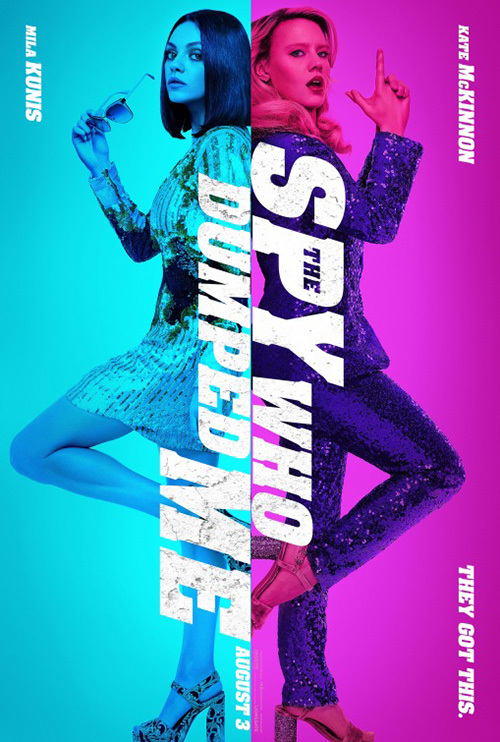 Oh what a five-month postponement and complete marketing overhaul can do to transform a niche thriller into a family friendly blockbuster event. Luckily we have the evidence of what was, though. We can look back at the first poster and see the dual faces of intimidation thanks to WORKS ADV and Frank Ockenfels’ photography. Here’s a boy covered in mud and ready to kill, flames licking at his chin. These two figures seek blood and are willing to do whatever is necessary to survive. Rage fuels their flight. 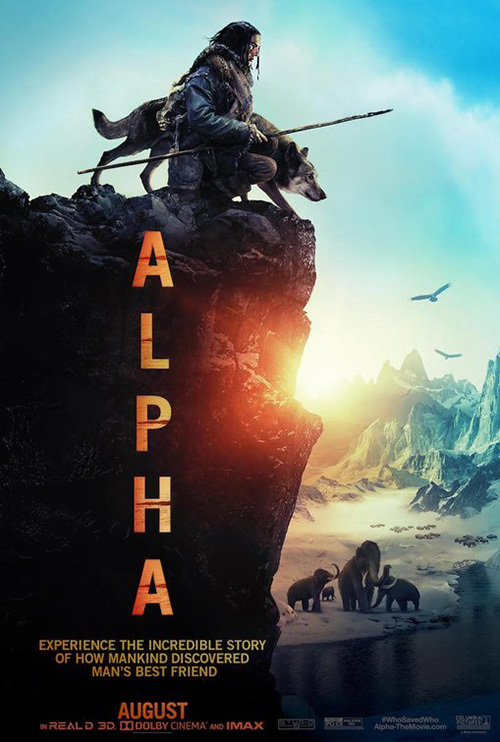 Fast-forward to eclipse’s wholesome tagline with its aspirational view of a family of elephants in the distance and a docile pooch following its master on an adventure that will only bring them closer together in the fore. We’re talking night and day when it comes to tone. What makes it even weirder is that I haven’t heard anything about the film getting extensive reshoots or anything. (How it could since its first release date was September 2017?) It’s as though test screenings showed children liked it more than adults and the studio decided a shift in focus onto them was their best chance for success. Luckily most movie-going audiences have short memories and will probably forget the original poster and trailer’s wildly different intent. 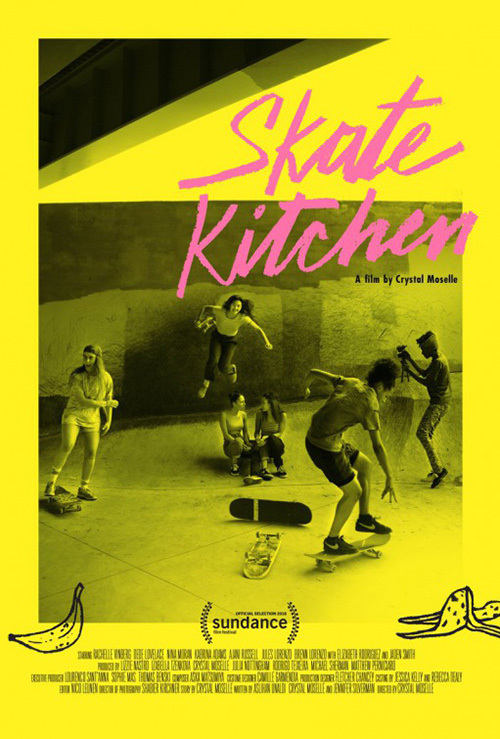 Skate Kitchen (limited August 10) doesn’t suffer from the same schizophrenia, but it is interesting to compare the down and dirty aesthetic of its festival one-sheet to the polished photography of its studio advert. 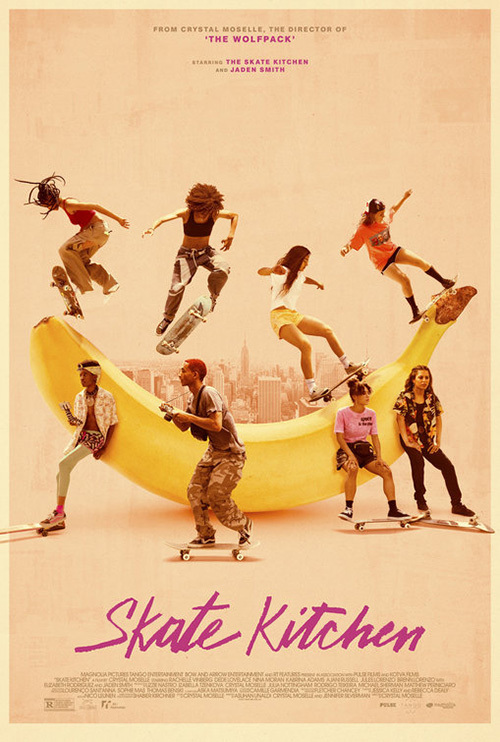 There’s a grunginess to the first that lends itself to the subject of skateboarding—especially since the stars of the film are a real life collective known for their skills on wheels as opposed to acting. This is the type of Xerox on colored paper effect you’d see in a flier handout taped to a telephone pole. It has crude drawings of banana peels and a hot pink scrawl of a title giving it character. It’s about an in-the-moment adrenaline rush of unbridled speed. The second loses that sense of ephemera. Here the banana is real and enlarged into a half-pipe populated by the boarders in glamour shot poses. 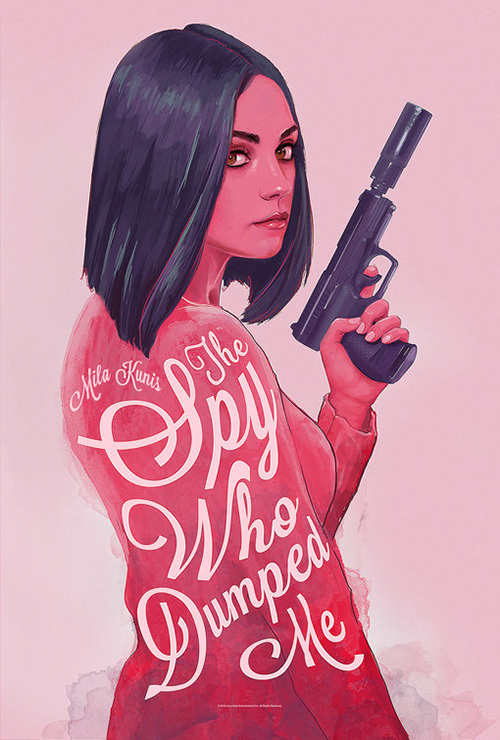 The action is manufactured, the artifice of this fictional narrative on display rather than pushed to the background so the realism could remain intact. Skate culture has literally been replaced by Hollywood convention rather than injected into it. Where the yellow, in-your-face loudness jolted me out of my multiplex malaise, the soft peach pallor of the other lulled me back to sleep. The best films for expansive campaigns are those utilizing multiple genres. When you have more than one tone and aesthetic to capitalize on, you can go for broke without risking audience alienation. Throw some comedy at viewers to remind them their actioner isn’t just about explosions. Add some drama to show thrills hide behind the camp. 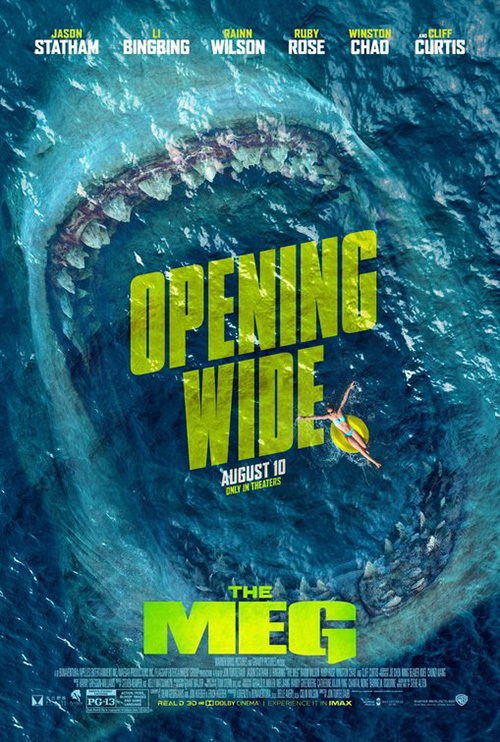 It’s in this vein that The Meg (August 10) is able to keep churning out new posters on a regular basis. 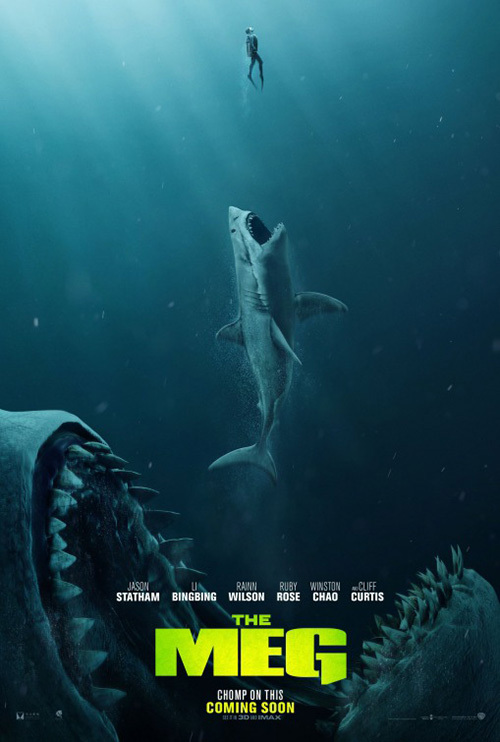 Canyon Design Group can focus on the scale of this prehistoric shark by leaning into the horror aspect of what its hunt could deliver while Statement Advertising can infuse their depiction of scale with a clever “Opening Wide” pun. We therefore both fear what might happen to the characters putting their lives on the line to stop this beast and revel in their inevitably hilarious, hubristic demises. 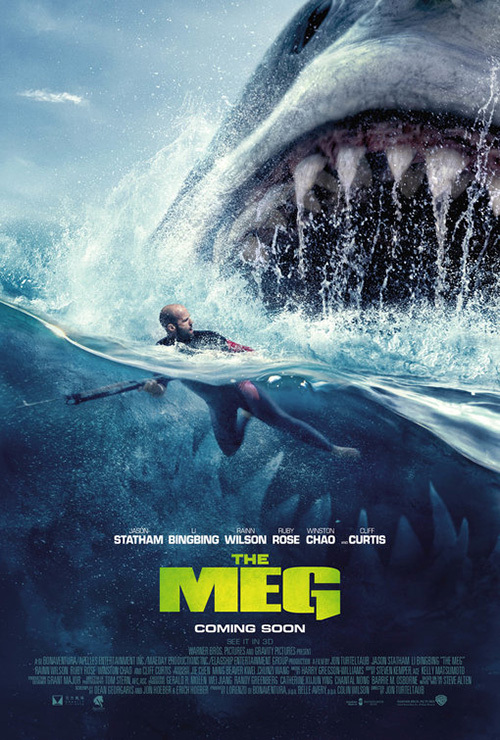 But there’s also a lineage to uphold via Concept Arts’ food chain progression from man to shark to megalodon. 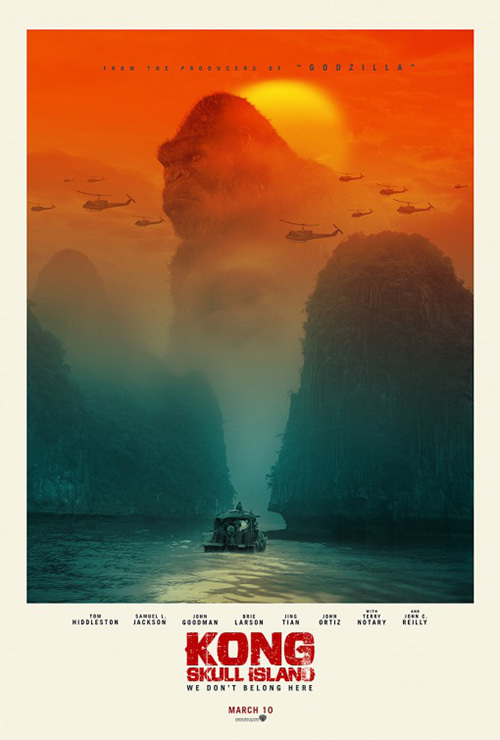 And from that nesting doll depiction we can move towards the appeal of bright colors and throwback artistry wherein the orange-red sky behind a doggie-paddling canine could feasibly connect this film to the MonsterVerse courtesy of Kong: Skull Island similarities. Scale aside, however, these four all retain a sense of drama that overshadows any potential humor. If anything they are dark enough to earn strange looks from those who hear you laughing after taking a gander. So it’s nice that we do get one poster refusing to divide its intent. This illustration is hilarious in that the numerous inflatable tubes flying through the air thanks to the creature’s aggressive surfacing maneuver look like donuts. 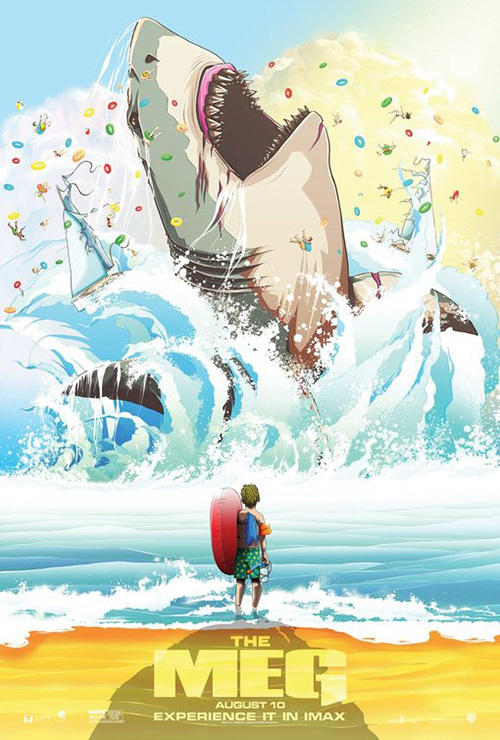 Rather than appear as a scene that little boy in the foreground should fear, it comes across as a dance party with colorful confetti and flailing attendees enjoying their ride through the sky. 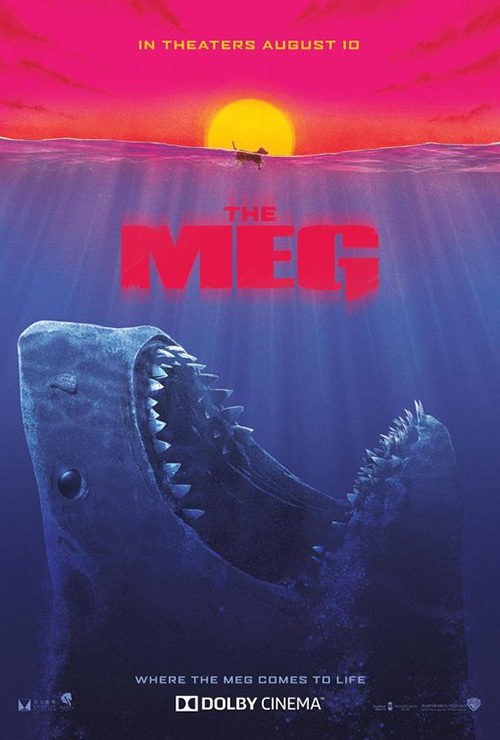 The only real quandary with this series is the title itself and the weird separation happening with the “G.” Is that supposed to be the megalodon’s dorsal fin coming up for air? It looks more like a periscope to me. Neither good nor bad, I simply wonder what the designer was thinking. Maybe he/she just thought it looked cool. 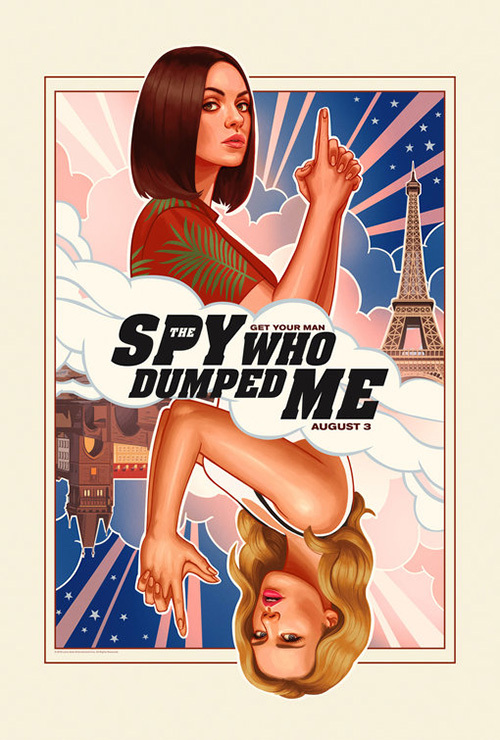 It shouldn’t surprise anyone that the second example of variety comes from another action/comedy in The Spy Who Dumped Me (August 3). Instead of having a monster to combat, however, the studio focuses upon its leads’ personalities. 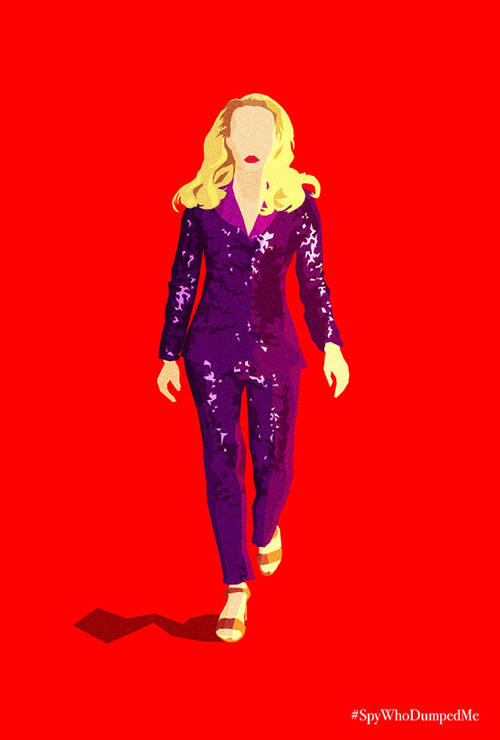 LA (with photography from Cullin Tobin) puts its stars front and center with Mila Kunis’ serious expression opposite Kate McKinnon’s humorous embellishment. The former is thrust into a situation spiraling out of her control while the latter goes along for the ride with excitement that may or may not prove incongruous to the peril. What’s great about this campaign is that we don’t simply receive these photographic depictions with different coloring. 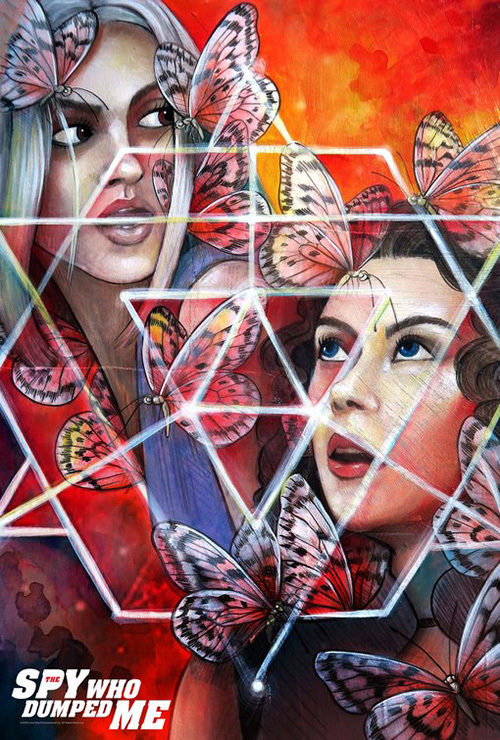 The studio instead enlists outside artists to commission their interpretations of the property with unique styles all their own. So we get June Bhongjan’s gorgeous paintings with hand-lettered text; Monica Ahanonu’s minimalist constructions resembling fashion designer sketches collaged with texture; and Amanda Lynn’s idiosyncratic illustration so disinterested in likeness that it feels like a wonderfully creative foreign bootleg DVD cover. There are a ton of these things from the seemingly vectorized work of Allison Reimold’s detailed, three-dimensionally rendered playing card to Adrianne Walker’s flatly simply portraiture above a smoky exhaust fume title. They each arrive with varying levels of success (my faves are the above by Bhongjan and Ahanonu because of their polished yet uninhibited rough draft feel). Put the lot of them together and you see a mammoth marketing budget. Beyond that bankroll, though, is a true desire for artistic ingenuity above tired rehashes.